A large craft area now consumes the family room in Asma’s home. The table is cluttered with colorful fabrics, threads, candles, and patterns and drawing for new designs. Asma carefully crafts her newest creation, while her children prepare for their next trip to the local bazaar. By all accounts, Asma’s life looks happily busy and secure—but it’s been a difficult road to get to this point. Asma grew up in the outskirts of Amman, married young, and gave birth to five children in quick succession: three boys and two girls. Life as she knew it changed dramatically when her husband unexpectedly passed away and Asma found herself entirely responsible for providing for five children. They had accumulated little to no savings and with only having a 10th-grade education Asma felt at a loss as to how she could support her family. To meet immediate needs, Asma took out a loan but found that she was only qualified to receive 200 JOD – her rent alone was 175 JOD. If her family were to safely survive their deteriorating situation, Asma knew she needed to find a way to earn a steady income. Asma always had a special talent for creating toys for her children out of old or broken items around the house so thought why not turn this skill into an income. 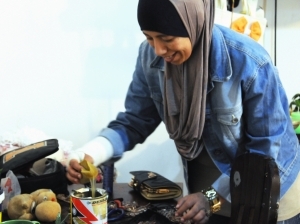 Asma immediately started to test her abilities—challenging herself to repurpose old items not only into toys but also into new household trinkets and accessories. 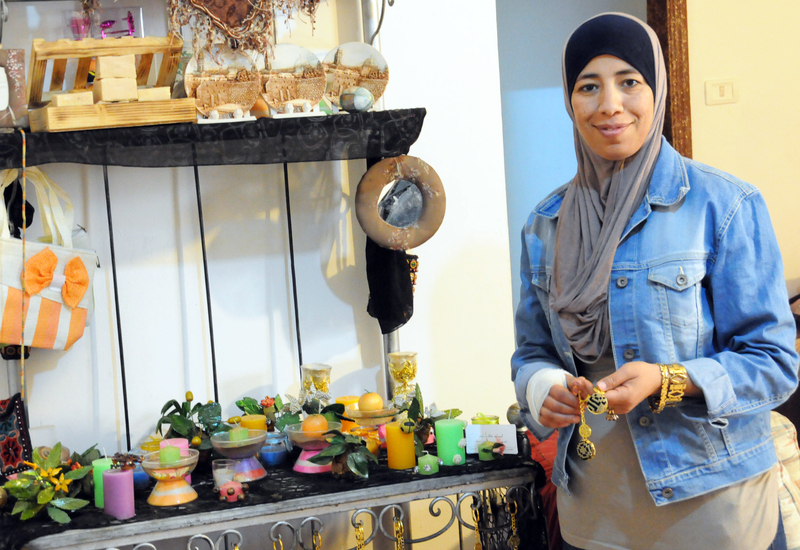 While her products improved, Asma still lacked the knowledge and guidance on how to turn her creations into a profitable business. 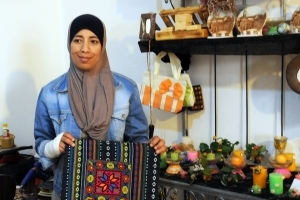 After seeking help from the Ministry of Development in Jordan, Asma was referred to one of NEF’s Siraj Centers near her home and qualified to attend a business development training there. On the first day of the training, she decided to bring some of her merchandise so she could showcase her business idea and test her products. The other women at NEF’s Siraj Center were so impressed that she actually ended up selling everything she brought that day. Asma felt encouraged by their warmth and support and felt she had finally found a place that would help her turn her life around. 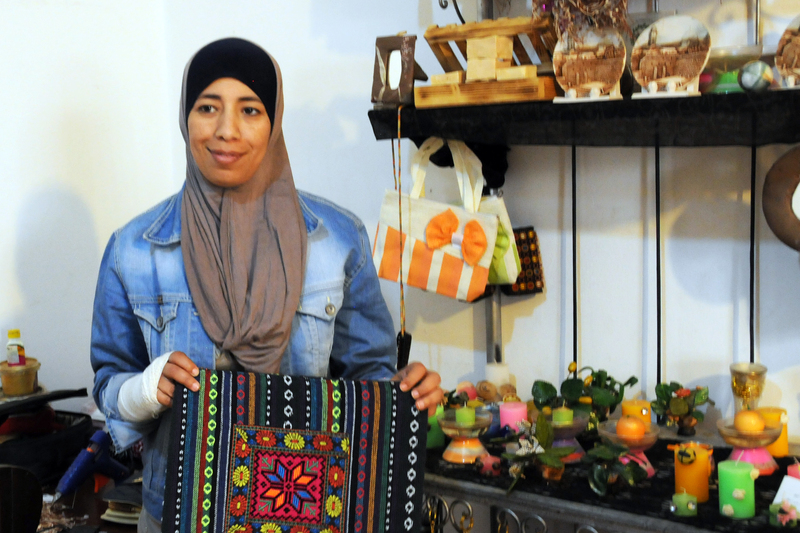 With help from the training, Asma developed a formal business plan and was awarded a cash grant to help her buy the supplies she needed to improve the quality and increase the number of her products. She described NEF’s training as “the starting point of her life.” She went on to explain that through the training she was able to learn how to correctly price her items (taking into account the cost of her raw materials, time, and transportation to and from the bazaars) and deal with customers. Of equal importance to her was the sense of community she gained by being connected to such an encouraging group of women. She said that they continue to keep in touch, provide each other with support, and learn from one another. Now remarried, Asma shares how supportive her family is of her business. Her eldest shared his pride in what his mother has accomplished saying that they have seen how hard she has worked to provide for them all these years which is why they want to support her work as much as they can. All of Asma’s children join her at each bazaar or craft festival she attends, helping her deal with customers and set up her display. Another one of her sons commented on how much he has learned about running a business from watching Asma, saying when he is old enough, he would like to take business classes like his mother took. Because of the gratitude Asma feels for being able to turn her life around, she now makes time for her family to do voluntary work so they can give back and provide hope to families who are struggling. NEF’s economic livelihoods work in Jordan is funded by the U.S. Dept. of State Bureau of Population, Refugees, and Migration and City & Guilds.